Myxomas are benign tumors arising from mesenchymal tissues throughout the body. These tumors are usually seen in the atrium of heart and the jaw bone. Only a few cases of primary intracranial myxomas have been described in the literature. 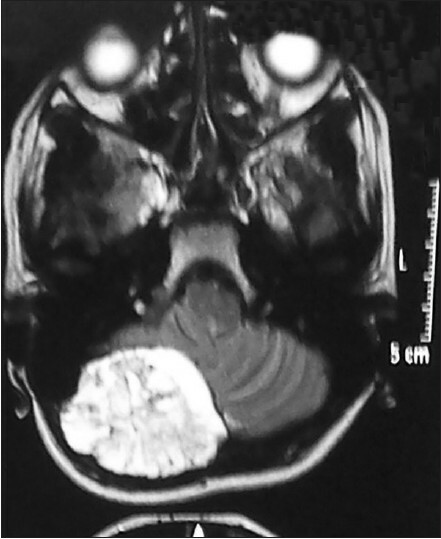 A rare case of primary myxoma of the occipital region is presented. A 12-year-old boy had mild occipital headache for the past 2 months which was unnoticed. Local hairdresser noticed a bulge in the occipital region while doing haircut and informed the parents and medical opinion was taken. He was seen by a neurosurgeon and after investigations he underwent craniotomy. Near total resection of the tumor was achieved. Histopathology and immunohistochemistry confirmed it to be a myxoma with no underlying cardiac focus. Following surgery the patient had rapid recovery. Myxoma is a benign tumor that originates from the mesenchymal tissue, often from the heart, skin, subcutaneous and aponeurotic tissue. Primary intracranial myxomas are rare and only few cases have been reported in the literature. Though metastatic brain myxomas from atrial myxomas are known but primary intracranial myxomas are very rare. Complete surgical resection of these tumors provides an excellent prognosis. A 12-year-old male had 2-month history of mild occipital headache which was unnoticed. Local hairdresser noticed a slight bulge in the occipital region while doing haircut. He reported this to the parents to seek medical advice. His MRI and CT brain showed evidence of a 5.3 × 4.6 × 4.9 cm expansile lytic sclerotic lesion arising from the right occipital bone showing prominent trabecular pattern. No significant soft tissue component or enhancement was seen. Anteriorly the lesion was causing significant indentation of the right cerebellar hemisphere. There was no edema but it was producing erosion of the right half of occipital bone extending up to C1 vertebra [Figure 1]. The diagnosis suggested was a malignant bone neoplasm (Ewing sarcoma) or intraosseus hemangioma. A craniotomy with near total excision of the mass was done leaving residual mass near the vertebral artery. Multiple small bony and soft tissue pieces with a slimy surface were submitted for histopathology. Sections after decalcification showed bone and tumor cells. Stellate cells with abundant myxoid matrix with few cells showing pleomorphic nuclei and few tumor giant cells were also seen. Histological diagnosis of fibromyxoid tumor [Figure 2] was made and immunohistochemical markers were advised. On immunohistochemistry the tumor cells expressed Vimentin [Figure 3]. They were immunonegative for SMA, Desmin, CD34, S-100, EMA, CK, CD31, and GFAP. The Mib-1 proliferation was <1%. Final diagnosis of myxoma with stromal atypia was made. 2D-echocardiography was done to search for primary but there was no mass lesion in the cardiac muscles. Postoperative radiotherapy for the residual lesion was started two weeks after wound healing and a total of 50.4 Gy in 28 fractions to tumor bed was given on linear accelerator. Mean dose to the brain stem was 1237 cGy. Post-radiotherapy CT Scan showed minimal edema and no residual disease [Figure 4]. Myxomas, first described by Virchow, are benign tumors derived from mesenchymal origin. They usually occur in the cardiac muscles which are known to cause neurological symptoms due to thromboembolic events and metastasis to the brain. , Primary intracranial myxomas are extremely rare. Only few reports [Table 1] in literature exists on cerebral tumors that histopathologically resemble myxoma. , The site of occurrence is highly variable. ,,, Myxoma may occur in any part of the cranial base but mainly occurs at the joints, such as sphenopetrosal suture and the petrooccipital suture. It has been reported that tumors were located behind the sigmoid sinus of the posterior fossa,  hypophyseal fossa,  cerebellopontine angle area,  and the mastoideum of temporal bone. Our patient had mass in the occipital region near occipito parietal joint indenting the right cerebellar hemisphere and was asymptomatic. None of the patients including ours had a cardiac focus and there was no familial inheritance. As myxomas are benign tumors, treatment is complete resection. This might not be feasible when the tumor invades into or derives from the skull base or vital structures prohibit a radical resection which may lead to recurrence. In our case a residual mass near the vertebral artery was left. He was asymptomatic after removal of the tumor but received radiotherapy for the residual lesion. Myxomas are most prevalent in patients in the third and fourth decade but can occur at any age and both sexes. They may arise from the meninges mimicking a meningioma or other forms of meningeal tumor. Those appearing intracranially with no meningeal or dural attachment arise probably from the small vessels supplying the brain parenchyma. Those arising from the bone develop in the marrow, expand the cortex, and destroy bone by aseptic necrosis. In this case, MRI showed a well-defined soft tissue mass, extra-axial in location, in the posteroinferior aspect of right cerebellar hemisphere, producing erosion of the right half of occipital bone extending upto C1 vertebral level. An echocardiography is mandatory in all cases to differentiate a primary intracranial myxoma from atrial myxoma with embolisation. Radical surgery has been associated with a long-term outcome in all cases. Radiation treatment has little or no effect on these tumors. Zhang et al., delivered postoperative radiotherapy to eight patients in his series of 23 patients. Partial resection was done in 16 cases and total resection in seven cases. Six patients were disease-free in follow-up. Myxoma recurrence was seen in four patients. The mean duration of recurrence was 5.9 years and required second surgery. Hence for full appraisal of radiotherapy, further studies are required, although in our case we gave post-operative radiotherapy in view of the residual disease left by the surgeon. The differential diagnosis for myxoid intracranial tumors includes myxomatous meningioma, intracranial neurothekeoma, epithelioid hemangiothelioma, sarcoma with myxoid degeneration and metastatic myxoma. Immunohistochemistry is helpful in distinguishing these lesions. Epithelial membrane antigen (EMA) positivity is seen in patients who have meningioma with myxoid components. 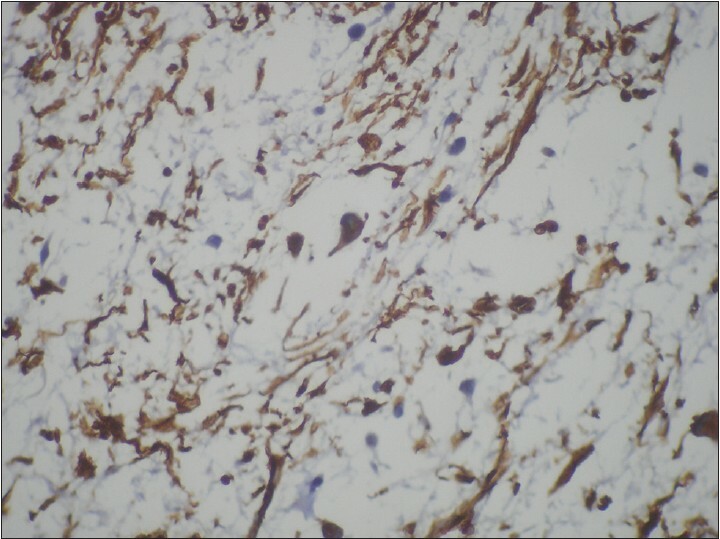 Sarcoma stains positive for smooth muscle actin and desmin and neurothekeoma stains positive for S-100 protein. True myxomas will stain positive for vimentin only and other markers are negative suggesting its mesenchymal origin. Myxomas occur rarely as part of familial and inherited disorders such as Carney's complex or Marfan's syndrome; however, such associations were absent in this patient. Primary intracranial myxoma should be distinguished from other myxoid intracranial tumors such as myxomatous meningioma, epitheloid hemangioendothelioma or sarcoma through appropriate pathological and immunohistochemical analysis. A metastatic cardiac myxoma should be ruled out through cardiac evaluation including an echocardiography. The distinction between primary intracranial myxoma and neurothekeoma of the meninges also needs to be reassessed. Surgery remains the main treatment and role of radiotherapy is not established but may be given for residual disease. 1. Virchow R. Basic cell pathology in their foundation and physiological and pathological tissue science.Berlin: August Hirschwald; 1871. p. 563. 2. Desousa AL, Muller J, Campbell R, Batnitzky S, Rankin L. Atrial myxoma: A review of the neurological complications, metastasis and recurrences. J Neurol Neurosurg Psyschiatry 1978;41:1119-24. 3. Lee VH, Connolly HM, Brown RD Jr. Central nervous system manifestations of cardiac myxoma. Arch Neurol 2007;64:1115-20. 4. Graham JF, Loo SY, Matoba A. Primary brain myxoma, an unusual tumor of meningeal origin. Neurosurgery 1999;45:166-9. 5. Klein MV, Schwanghofer BW, Sobel DF, Hesselink JR. Primary myxoma of the posterior fossa. Neuroradiology 1990;32:250-1. 6. Nagatani M, Mori S, Takimoto N, Arita N, Ushio Y, Hayakawa T, et al. 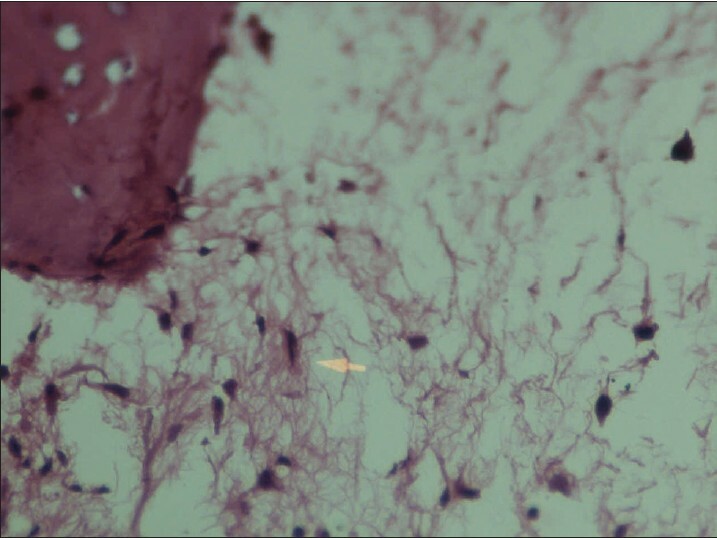 Primary myxoma in the posterior fossa: Case report. Neurosurgery 1987;20:329-31. 7. 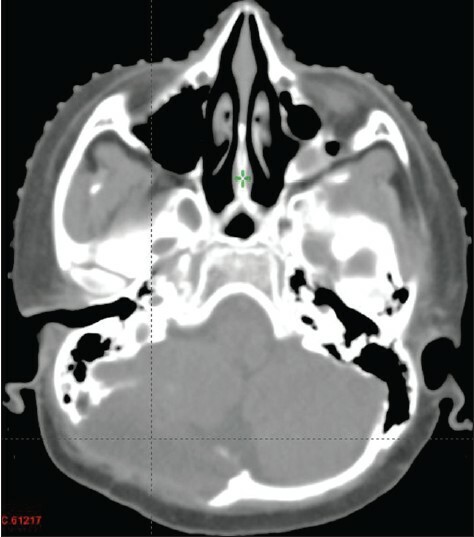 Yin H, Cai BW, An HM, You C. Huge primary myxoma of skull base: A report of an uncommon case. Acta Neurochir (Wein) 2007;149:713-7. 8. Zhang L, Zhang M, Zhang JJ, Luo L, Xu Z, Li G, et al. Myxoma of the cranial base. Surg Neurol 2007;68 Suppl 2:S22-8. 9. Zhen W, Chen S. Left CPA myxoma case report. Chin J Cancer 1997;2:84. 10. Ipek G, Erentug V, Bozbuga N, Polat A, Guler M, Kirali K, et al. Surgical management of cardiac myxoma. J Card Surg 2005;20:300-4.